Comments Off on What’s next for CRM in Dynamics 365? What’s next for CRM in Dynamics 365? The times, they are a changin’! With last year’s re-branding of Dynamics CRM to be included with the multiplex that is now Dynamics 365, we were all given a ticket to ride yet another Microsoft roller coaster. Using Microsoft CRM internally and developing solutions for this platform, our team has paid close attention to all news coming from the Microsoft executive team. The most recent update came in the form of an extensive 3-day webinar preview for changes to be unveiled to users later this fall/winter. I’m here to highlight some of the more exciting things. There was one constant theme: There’s big big changes coming. They are now doing multi select pick lists so you can select more than one item out of a pick list. This is advantageous in our system, as currently we have multiple fields just to track what product a customer is interested in. We check each one individually, but with the new development, you can have them all in a list and make your selection from there. This is something that has been missing for quite some time and I’m glad to see its addition. There’s a major, major UI change. This is the area I’m most nervous about. I’ll always be weary of complete UI redesigns, and that’s exactly what it sounds like they’ve done here. Last time, it was such a painful experience for users, partners, and developers and was not a user intuitive experience. You couldn’t find your way around and you had to scroll endlessly. If they do it right, it could be awesome. However, until you actually see it and play with it, the nervousness of the unknown exists. You can bring in outside data and they’ll have a native integration into Azure. You can bring your financial data in as a virtual entity, but you’ll be modifying a completely different database so you’re not actually storing anything to the CRM database. One big mystery that remains… Microsoft Dynamics 365 for Financials. I wish I had an update here to share, but alas this is being kept under wraps (or maybe behind caution tape). All that’s left to do is wait and see what rolls out in a few months. I hope it’s the best version yet! Written by Bryan Page, Developer at Rockton Software, a Microsoft Dynamics 365 application provider. Check out our latest application, Recurring Billing, now live on the Microsoft AppSource. Posted in About Microsoft Dynamics 365, About Microsoft Dynamics CRM, by ISV/Add On Partners | Comments Off on What’s next for CRM in Dynamics 365? 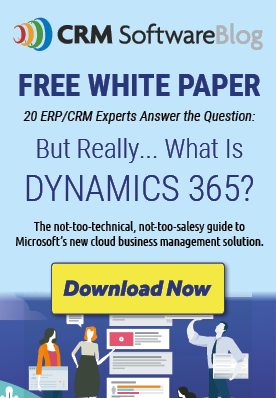 What are the Advantages of Customizing Your Microsoft Dynamics Customer Relationship Management (CRM) Tool? Quels sont les avantages d’un outil de gestion de la relation client (CRM) Microsoft Dynamics personnalisé?